Email: betoangel@aol.com for more specific directions and to confirm times. 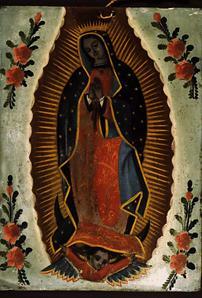 Our Lady of Guadalupe is the most famous image of the Virgin Mary from Latin America. She is venerated also as the Virgin of Tepeyac, since her apparition in 1531 took place on the Hill of Tepeyac outside of Mexico City, which historically was a sacred site of the Aztecs and other Nahuatl speaking people of the valley of Mexico, a place where the divine feminine and the archetype of the Mother were honored. It was only natural that worshipers would both continue their old devotions and consciously seek to express them within the new religious framework. St. Juan Diego Cuauhtlacoatzin experienced the Holy Mother speaking to him in his native Nahuatl, and thus becomes a patron of the deep wells of indigenous spiritual wisdom.